Uniting Church celebrates 150 years of history. 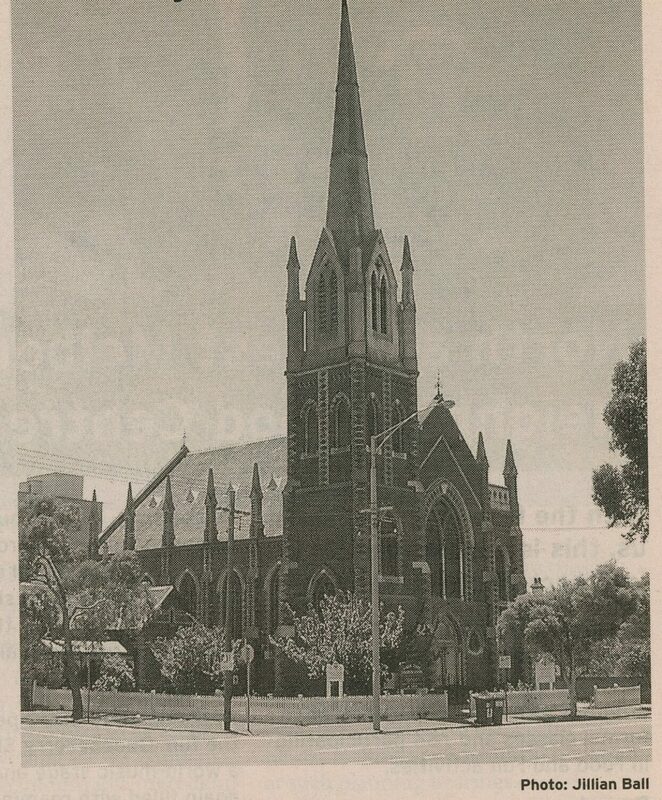 In 2004 the Uniting Church congregation of Mark the Evangelist will celebrate its contribution to the history of the North Melbourne community over the past 150 years. The sesquicentenary celebrations will take place from Friday 29 October to Sunday 31 October 2004 and will include special church services, historical activities, musical presentations, lectures, videos, historic photo displays and a book launch. The first service of the Presbyterian Church in North Melbourne was held in the loft of a blacksmith's shop in Villiers Street on 29 October 1854 Five years later, in 1859, the first church, a bluestone building, was constructed in Curzon Street and named Union Memorial Church, in honour of the amalgamation of the three strands of the Presbyterian Church. In 1878 this church was removed to a new site in Elm Street and replaced by the present church. The old church became the church hall and is still in use. It has been concrete rendered and a bell has been suspended over the facade. Since the First War the union of several harmonious churches had been a topic of discussion among church officials. This resulted in the founding of the Uniting Church of Australia in 1977, when the Methodist, Congregationalist and Presbyterian churches merged. Over the years Mark the Evangelist has developed pastoral linkages with the chapels at Queen's and Ormond colleges at Melbourne University, and with the Anglican—Uniting congregation in Kensington. The present congregation numbers some 90 families, drawn from many Melbourne suburbs including North and West Melbourne, Parkville, Fitzroy, South Yarra, Carlton, Yarraville, Ascot Vale, Flemington, Kew, Bulleen and Hawthorn. Through the Hotham Mission, directed out of an office in Curzon Street, Mark the Evangelist has outreach activities, which provide support and housing to students, asylum seekers and prisoners, and an on-site child-care facility. The history of the parish is rich in events of social and political significance. There is the legend that the Labour Party split took place at a meeting in the Elm Street Hall in 1955. Some parish celebrities are the Reverends Archibald Gilchrist, Stephen Yarnold and Davis McCaughey, a former Governor of Victoria. The 1879 Gothic revival-style church reflects the Romanesque influence in its polychrome brickwork and the French Gothic in its asymmetrical tower (45.8 metres) and pinnacle buttresses. The interior has a beautiful rose window featuring the four reformers, John Knox (Scottish church reformer), Martin Luther, John Calvin and Alexander Henderson (Covenanter). Good resonance and acoustic qualities make the church suitable for many musical activities. The present organ, at the back of the church, replaced a former organ in 1987 and was built by a Danish organ-builder, Knud Smenge, then resident in Melbourne. As the sesquicentenary approaches, a website is being developed which will be available by the new year for ex-parishioners to register information of a historical nature. The historical lecture will be delivered by a historian (to be announced) who will be able to draw on an extensive pool of information in Uniting Church archives and records in North Melbourne.